Hands-On Bible Curriculum® Learning Lab® is brimming with the tools you need to lead a successful Sunday school class, including creative gizmos that help kids experience God’s Word. Incredible Learning Labs include a Teacher Guide, lively gizmos, CD with music and sound effects, and unique sensory teaching tools. Everything you need to connect kids to Jesus—in fun, unforgettable ways! Group’s Interactive StoryBoards™! Your young students are at a wonderful age of discovery. They want to learn about everything by touching, tasting, smelling, seeing, and hearing. Group’s Interactive StoryBoards actively encourage children to use their five senses to learn basic biblical truths. You’ll enjoy introducing God’s love to your toddlers and 2s in this special way. Get out the StoryBoards and Sensory Packets and have a great “hands-on” time as you prepare these creative teaching tools. Your Toddlers and 2s Learning Lab® contains self-adhesive squares, three Sensory Packets with various tactile items, three StoryBoards, and a CD. 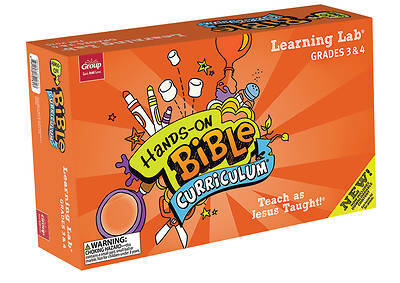 Vibrant gizmos create thematic ways to bring the Bible to life. You'll use these great tools in every lesson, every week. The Teacher Guide (sold separately) explains how and makes it fun and easy! Audio CDs come with music, dramas, and cool effects that make your lesson extra memorable. (One is included in each Learning Lab.) Additional CDs are available separately. Teaching Puppets (sold separately). Cuddles the Lamb becomes a teaching assistant in Hands-On Bible Curriculum. Use the puppets in skits, and encourage children to tell Cuddles what they’ve learned in class. Teacher Guide is sold separately. WARNING: CHOKING HAZARD– Not for children under 3 years of age without adult supervision. Adult assembly required. This contains a small part, small ball or marble.